Thank you so much to everyone at Omnia and especially to Louise for sorting my teeth out! I am so so happy with the outcome and I always get complimented on my teeth now! Everyone was very professional and the lovely reception staff even looked after my baby whilst I was getting my retainer sorted. They really do go above and beyond here and I will be telling all my friends to get their Invisalign here! Again thank you, I just wish I had done this sooner! You’re never too old or late to start Invisalign treatment. I was 56 years old when I started my treatment two years ago and I am now close to the end. I suspect I presented a tough challenge, as a consequence my journey has been a lot longer than most. Although I was a confident professional, I had always been embarrassed by my teeth. Every photograph of me was the same unnatural and tight lipped. Smiles were an ordeal. In January 2017 with a lifelong fear of going to the dentist and a New Years resolution committed to paper in my back pocket, I visited Dr Louise Gidda at Omnia. It proved to be the best thing I have ever done. From my first free consultation it changed my life. From start to finish it has been a relaxed and pleasant experience. Louise’s enthusiasm and energy to achieve excellent results is highly motivating and completely reassuring. The transformation has not stopped at my smile and straight teeth. I was never short of confidence but my entire attitude and perspective on life has changed dramatically during the treatment and the results are fantastic. All the way through I have experienced a highly professional, efficient and friendly service, from the reception desk to the dentist chair, all at a very reasonable cost. I can not recommend the practice and the treatment highly enough. There are two new rules in my life now. It’s never too late and you’re never too old to start anything new. Thank you Louise and the rest of the team. I can never thank you enough. I was always smiling but from now on I can do it with a really nice smile! Dr Louise was excellent during my 10 month treatment, explaining everything and answering all the questions. Dr Tirij made me to overcome the fear for the dentists with his light hand. I am something more than satisfied and happy with the final result. A massive thank you to Louise, Tirj and all the assistants who were always so kind and helpful. Thank you for sharing your heartfelt review. It has been a pleasure to help you achieve your ‘really nice smile !’ Your kind words and recommendation are greatly appreciated by Louise, Tirj and all of the team at Clear Braces Solihull. Such a wonderful staff from the administration team to clinical. The team are never without a smile and have gone to great lengths to be accommodating. I cannot thank you enough, I'm really happy with the result! Would definitely recommend! Had an amazing experience. My teeth look amazing! The service at Omnia was excellent, with great, friendly staff. My dental treatment was impeccable with no pain having teeth removed, braces fitted and retainers. I am delighted with how straight and clean my teeth look now compared to before I began my treatment just over a year and a half ago. And even when my retainer got chewed by a dog they offered a speedy service with new Invisalign retainers which are really comfortable to wear. I would recommend Omnia Dental Spa as Dr. Gidda has provided me with great service and fabulous results. Tirj and Louise have both been fantastic during the course of my Invisalign treatment - from my very first appointment, the whole treatment process has been wonderful and I'm so pleased with the results (can't wait to just wear my retainers at night though so I can start snacking again!). Must mention too that all of the team at Omnia Dental Spa have been so friendly and welcoming on every single visit - wonderfully hospitable, and a great personal service, thank you! Invisalign braces are the best thing I have ever bought. I grew up with an overbite and had lots of nasty comments and could never smile showing my teeth. Now for the first time I can actually smile with confidence and it has changed my life. Highly recommend to anyone! Especially those who are uncomfortable with their teeth but are embarrassed to wear braces. At first they feel a bit unusual, especially the attachments, but it doesn't last long, after a day or so if feels completely normal and comfortable, I often thought I had forgot to put them in because I couldn't feel them. They are so easy to wear and don't restrict what you eat or drink at all. You get a new set of aligners every few weeks, depending on your treatment, so there's no painful tightening. In the whole time I have had them nobody has ever noticed that I wore braces and were always shocked when I told them. Louise and all the staff were extremely friendly and I always felt welcome and there's no 'scary visit to the dentist' atmosphere there at all. They explain everything that is going to happen very well and give you plenty of options to make sure the treatment suits you. Even when I moved down south they helped make my appointments to suit my schedule and would email me or send items in the post to help me when they could. The change this has made to my life is incredible and I can not thank the team at Omnia Dental Spa enough for finally giving me the smile I always wanted. I went to Omnia for a full set of Invisalign braces. From the start, all the staff were very friendly and helpful, keen to answer any questions about the treatment. The facilities are clean and modern, making you feel at ease. I am very pleased with the results and feel much happier when I smile now. Very professional service, I felt comfortable and confident during my dental work being carried out. Excellent results, highly recommendable. Went here for Invisalign braces after doing lots of research. Absolutely over the moon with the results. Louise, my orthodontist, was fantastic. Very friendly and made me feel very relaxed all the way. She responded to any emails almost immediately when I needed advice outside of my appointments. I had 2, rather difficult!, teeth extracted by Dr Tirj Gidda at the clinic, who was so reassuring through the whole process. All the staff are very friendly and welcoming, nothing is too much trouble for them. The clinic is easy to get too, easy parking and is clean and modern. Would highly recommend this clinic to anyone looking into invisible braces. One very happy customer ??. I have recently finished my Invisalign treatment in time for my wedding and I am thrilled with my results. After having looked at a few providers I am so pleased I had my treatment with Louise and Tirj, both extremely knowledgeable and friendly. They both worked around my working hours to help me get the results in a short space of time. Would highly recommend to anyone! Thank you for taking the time to share your review. Your lovely feedback is appreciated by both Tirj & Louise Gidda. It's great to hear that you are so pleased with your smile following your Invisalign treatment. Amazing service from start to finish. Really happy with how well they now look, after getting veneers and a crown on my front teeth. Would highly recommend!! When I started treatment and looked at the "Clincheck" images, showing what the end result should look like, I was a little sceptical that these plastic aligners could achieve such an improvement to my teeth. However, I have to say that I am delighted with the result. Thanks Louise! The value for money is excellent as all follow up adjustments and treatments are included. The staff are all really friendly and helpful. Any of the issues or concerns I had during treatment were dealt with quickly and efficiently. Thank you for taking the time to leave your comprehensive and insightful review of your Invisalign treatment at Omnia Dental Spa. It's great to hear that you are 'delighted' with your new smile. Your kind feedback is greatly appreciated by Drs Tirj and Louise Gidda and the whole supporting team at Omnia. I have recently had invisalign braces with Louisa- my treatment finished august 2017. I would highly recommend this practice; all the staff are really helpful, and Louisa went above and beyond to ensure my teeth were how I wanted them. She made me feel at ease and was happy to answer all my questions. I was also extremely happy that they use a scanner to make your aligners, rather than having impressions. Anyone looking for brace work or invisalign: I would definitely give them the details for this surgery! Thank you for your lovely review of your Invisalign treatment with Dr Louise Gidda. It's great to hear that you are pleased with your smile and that you particularly appreciated the iTero digital scanner. Your feedback is greatly appreciated by Louise and all of the team at Clear Braces Solihull. I would highly recommend Clear Braces Solihull for anyone looking to get braces in the Solihull or Birmingham area. Louise is an excellent Orthodontist, her expertise are second to none, she always answered any questions I had in a friendly and reassuring manner. She went out of her way to make sure my teeth were exactly how I wanted for my wedding and I couldn't be happier with the results. The practice is extremely friendly and the staff always ensure you are well looked after on every visit. Thank you for taking the time to leave your lovely review of the orthodontic treatment and care that you received from Dr Louise Gidda. 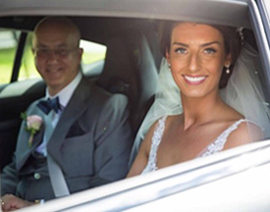 It's great to hear that you are so pleased with your smile, especially for your wedding day! Just picked up my retainers and I couldn't be happier with my results. I smile now. Thank you to all staff as so friendly and a massive thank you to Louisa. Thank you for taking the time to leave a review of the service that you received at Omnia Dental Spa. It's great to hear that you are so pleased with the results of your Invisalign treatment. Your lovely feedback is greatly appreciated by Dr Louise Gidda and all the team at Omnia. Great experience all round, staff very welcoming and comforting in the chair which really eased my worries as I'm a nervous dental patient, the invisalign experience was well worth it and very pleased with the results. Thank you for taking the time to provide your review of the care & service that you received at Omnia Dental Spa. Your feedback is greatly appreciated by Dr Gidda and all of the team at Omnia - KEEP SMILING! I have been a patient of Omina for 3 years now and I have received an outstanding service on every appointment. Dr Louise Gidda has done a fantastic job in straightening my teeth and has given me a beautiful smile. Dr Tirj Gidda recently repaired some abrasions and fillings a few weeks ago and again, an excellent, pain free treatment. Very happy with my results. Big thank you to all the staff team at Omina. So helpful and highly recommended. I had developed severe anxiety and spent 5 years too scared to go to the dentist after a bad root canal experience and a dentist and dental nurse who always made me feel like they had no time and everything was done in a rush…then I chipped a front tooth and had to find somewhere to go. Omnia was recommended and I gave it a go. Am so glad I did. Everyone is friendly, patient and kind. The three fillings I've had to have, including the front tooth, are brilliantly done by Dr Tirj Gidda. I'm no longer terrified at the prospect of a dental appointment and am grateful to the Omnia team for that! Thank you for taking the time to provide your review of the service and care that you received at Omnia Dental Spa. It's great to hear that we have been able to ease your anxiety. Your kind words are greatly appreciated by Tirj and all of the Omnia team - KEEP SMILING ! Fantastic experience, my teeth look amazing extremely pleased with the result. A Big Thank you to Louise for giving me beautiful straight teeth. All the staff at Omnia have been very helpful, nothing was too much trouble. After visting Omnia for a consultation I immediately felt as though I was in good hands and very at ease and comfortable with the staff and Dr Gidda. After having a lot of work done as child/teenager due to my teeth been knocked out in a traffic accident I have always felt very nervous and emotional when visiting the dentist so when I realised I had to have the whole lot replaced this was very daunting for me as im now a 40 year old woman and very conscious of the appearance of my teeth and how would look whilst the old bridge had been removed and having temp fitted ( which never normally look very good)I have to say Dr Gidda did amazingly well making them look realistic and they looked better than the old bridge! I have now had my permanent one fitted and I am thrilled with the results and cant stop smiling !! As a private practice it can be pricey but worth every penny if you want the best treatment and end result.. Regardless of cost I will returning Omnia as my regular dentist! Thank you very much for taking the time to share your feedback with us. It is great to hear how pleased you are with the treatment and care that you received at Omnia Dental Spa. It was very rewarding to see you smiling confidently again ! I am exceptionally pleased with my Invisalign dental treatment from Tirj and Louise Gidda. From the very outset, both Louise and Tirj provided me with a step by step, individual treatment plan that we modified to obtain the best possible results. I am amazed at how much the physical appearance of my teeth has improved. At the age of 48, my only regret is that I waited too long before acting on improving my smile. The dental practice and staff operate effectively and efficiently. Thank you. Thank you for taking the time to provide your lovely review of the care and service that you received at Omnia Dental Spa. Your feedback is greatly appreciated by Drs Tirj & Louise Gidda and all of the team at Omnia. I recently had a wisdom tooth removed after an abscess had formed underneath. I had an initial appointment and was prescribed antibiotics and was told I needed a second appointment to have the tooth extracted; Dr Gidda was very helpful in explaining everything to me and the reception staff went out of their way to find me an appointment as soon as possible. When I came back for the second appointment I was extremely impressed with the service that I received; I had several injections to numb the site and can honestly say I hardly felt a thing! Dr Gidda was very efficient in removing the tooth and it was so quick and painless I did not even realise it was out. Follow-up care was fully explained and I even received a telephone call a couple of hours after I had left the surgery to check that everything was O. K. I am very happy to recommend this modern practice for their friendly professionalism and expertise. Thank you for your lovely review of the service and care that you received at Omnia. Your kind words are greatly appreciated by Dr Tirj Gidda and all of the team at Omnia Dental Spa. We look forward to seeing you at your next routine appointment. The staff are very friendly, knowledgeable and tended to my every question / need. The results from my treatment are exactly as I wanted and with the use of the Invisalign proposal videos, the transformation within my mouth happened exactly as I had witnessed on the screen, 12 months earlier. I would highly recommend using this practice / team. Thank you for your review of the Invisalign treatment that you received at Omnia Dental Spa. Dr Louise Gidda and all of the team greatly appreciate your feedback and it's great to hear that you would highly recommend us to your family and friends. KEEP SMILING ! I had invisalign treatment on my teeth as more a vanity choice than a great need. Due to 'age' my teeth had moved slightly from being perfectly straight to having a very small gap in between the two front teeth and I felt the two front teeth were jutting out a little. Having had the treatment the gap seems to have closed and the jutting out is a lot better. Louise is thorough and very professional but also friendly in her explanation of the treatment. A long process but I feel worth it. The receiption staff were also excellent and put me at ease and were knowledgeable about the treatment. Thank you for providing your review of Invisalign orthodontic treatment at Omnia Dental Spa. It's great to hear that you are pleased with the results and also that you feel that the treatment was worthwhile. Your kind words are greatly appreciated by Dr Louise Gidda and all of the team at Omnia. KEEP SMILING WITH CONFIDENCE ! I started going to Mr Gidda in Bedworth many years ago as a NHS patient. When he went private and moved to Solihull, although I knew he was good, I thought, I'm not paying a fortune and travelling half way across the Midlands to see him! But…I soon changed my mind - I'm too long in the tooth (forgive the pun) to accept 'the average' or even worse! As a private dentist I found Mr Gidda still the same, a pretty excellent dentist, but as I went to him for some really fancy dentistry, as well as the normal, I also soon found him thoroughly trustworthy and pragmatic about the gains against the costs. I don't think you often have to PERSUADE a dentist you want this or that but I did! I now don't have goofy teeth, clunking dentures, grey fillings showing… Nah – I just have a fabulous smile and I'm ecstatically HAPPY!!! I give Mr. Gidda,10 out of 10 for workmanship AND 10 out of 10 for integrity. Thank you for taking the time to provide your honest and heartfelt review of the service and care provided by Dr Tirj Gidda. Your lovely comments are greatly appreciated by Tirj and all the team at Omnia Dental Spa. It is always great to see you and we look forward to catching up with you soon. In the meantime, remember to keep showing off your 'FABULOUS SMILE' !!! Actually look forward to coming here- well nearly!- the service is so good. The place is so clean and inviting. All the staff are very friendly and professional too. I am very pleased with the treatment I had, crowns and a bridge. I know I didn't give 5 stars for value for money but it's only because I do find it difficult to enthuse about paying out for my teeth - however having said that, it is so much better than NHS dentists and my teeth have never looked so good and I feel a lot more confident and actually smile broadly now! I have full confidence in the dentist, Tirj, and in no way feel pressured to spend more than I need to. I thought that I needed some more work done, but was told there was nothing that needed doing and it was only increased sensitivity that was giving me discomfort. Thoroughly recommend! Thank you for taking the time to write your lovely review. Your comments and feedback are greatly appreciated by myself and all the team at Omnia Dental spa. It's great to hear that we have got you smiling with confidence ! See you soon ! 7 months ago I started my Invisalign Treatment and now I have a nicest set of straight teeth to be proud of. All the Omnia Dental Spa Team were so supportive and Dr Louise Gidda was so professional and caring at all times. Thank you for your lovely review, your kind words are greatly appreciated by Louise and all the team at Omnia Dental Spa. It's great to hear that you are pleased with your Invisalign treatment. It's been a pleasure to treat you and remember . . . KEEP SMILING ! I went to Omnia because of a recommendation from a friend. I had the full Invisalign retainers. I had a gap in the middle of my bottom teeth and always felt embarrassed when talking to people. After my consultation with Louise Gidda I was given the various options available and we chose the best option available which was to make the gap larger and put in a false tooth. As my treatment was going to be over 27 sets of aligners I had special paint (Pontic) painted on the inside of the bottom set to hide the gap. A couple of times the paint came off but I only had to phone up and they would fit me into have it reapplied. When I had finished my Invisalign treatment I saw Dr Tirj Gidda who discussed the options available regarding the false tooth and helped me decide which option to go for. Two weeks later the false tooth was fitted and I was finished! At last I had the perfect smile and it didn't matter how much it cost, it was worth every penny. At every stage the staff at Omnia were there to offer advice and support. As soon as I had the first set, my confidence soared. Every time I had to visit the surgery all the staff made you feel very welcome, and would put you at ease. It has been the best thing I ever did, thanks Omnia Dental Spa I would definitely recommend you to others. I was very nervous about having my crowns replaced, I had them previously replaced 12 years ago and the experience was painful and one that I truly dreaded, but the whole experience was painless at Omnia and this meant everything to me. I would recommend Dr Gidda to anyone, he made me feel relaxed and explained every procedure clearly, his ability to make the whole replacement pain free was amazing and would now make me confident to have any treatment in the future, knowing I would be pain free. All the staff were so pleasant and friendly, the setting was clean and relaxed, although I travelled in from Warwickshire it was well worth the 30 minute trip! Having been with the same Dentist for 40 years, I was apprehensive about finding a new practice to perform cosmetic work as I wanted to improve the appearance of my teeth. From the moment I walked through Omnia Dental Spa's door I felt at ease and was impressed with the genuine warm welcome and modern facilities. Even better was the exceptional treatment provided, at an affordable price. Thanks to Dr Gidda's expertise and attention to detail my teeth look better than ever and I can't stop smiling!! :). Thank you for taking the time to provide your lovely review of the staff, facilities and service that you experienced at Omnia Dental Spa. Your comments are genuinely appreciated by all of the team and it's great to hear that you are now SMILING WITH CONFIDENCE ! I undertook invasilign treatment at Omnia and the whole process has been amazing. From my initial consultation to my numerous phone calls in worrying about many different things. Every member of staff has been supportive and absolutely lovely. I couldn't recommend Invisalign enough especially with Louise. Thank you for everything and those thinking about it you definitely should get Invisalign treatment! Thanks, Lauren Houlder. Thank you for sharing your experience of Invisalign orthodontic treatment at Omnia Dental Spa. It is great to hear that you are so pleased with your new smile. It has been a pleasure to treat you and we look forward to seeing you soon. Keep smiling! My experience at Omnia has been fantastic the team really take the time to make me feel welcome I am a very nervous patient but the team made me feel very relaxed. Dr Gidda did my Botulinum Toxin treatment and was very informative about the treatment and made me feel comfortable. I would definitely recommend to anyone to visit Omnia. Thanks again. It was lovely to see you recently and thank you for taking the time to share your experience of treatment at Omnia. It is always great to hear that our clients are pleased with the service that our team provide. We look forward to seeing you again. At my initial consultation with Dr Gidda he did a full dental health check and undertook the general 'work' that was required. He then advised me of the best way forward to achieve a good cosmetic result on two teeth that were heavily filled and broken. I was very impressed with the time he took to explain all he needed to do, the timeframe of the work and the costs. I am delighted with the finished result, I am not the best patient in the dentist chair and both he and his dental nurses were very understanding and caring. The practice manger and all of the practice staff are extremely helpful, polite and friendly. Omnia Dental Spa is a well run practice and such a tranquil environment to be whilst awaiting treatment and to be treated at. Parking at Omnia is easy as they have a large private car park. Thank you for taking the time to provide your review of the care and service that you received at Omnia Dental Spa recently. Your kind words and recommendation are greatly appreciated by all of the team at Omnia. We look forward to seeing you again at your routine appointment. I have been a patient of Omnia dental spa for several years. The practice provides a number of services all on site including an Osteopath, beauty treatments and an extensive dental service both cosmetic and health. The Practice is light and airy decorated to a high standard in postal colors with a reception waiting area overlooking a landscaped garden. All staff have always been cheerful, friendly and welcoming providing an excellent efficient service including text reminders of appointments. Dr Gidda, my dentist has a welcoming smile and ensures that I am at ease, never rushed. His work is extensive, professional and excellent; he is a perfectionist in his work, taking time to explain procedures and the reasoning behind them. I attend the hygienist every 3 months, she does a thorough job in maintaining the health of my teeth and gums and after care advice. What is important to me is that I have confidence in my dentist / hygienist to help me maintain a healthy mouth, teeth and gums. I can say without hesitation that they provide this excellent care, resulting in minimum treatment, and a lovely smile. All in all Omnia dental spa provides an excellent up to date full dental service with the added benefit of other treatments to provide a complete package to maintain optimal health. I highly recommend Omnia to anyone who requires the best dental care. Thank you very much for your thorough review of the staff, service, facilities and care that you have received at Omnia Dental Spa. It is always a pleasure to see you at Omnia and we are most grateful that you have taken the time to provide your wonderful feedback. Thanks once again on behalf of Dr Tirj Gidda and all the team at Omnia. We look forward to seeing you at your next appointment - keep smiling! Lovely dental spa, very friendly and relaxing environment !! Very happy customers. Thank you for your lovely comments about Omnia Dental Spa. It's a pleasure to be of service and we look forward to seeing you again soon ! After suffering most of my life, with a overactive sweat gland under both armpits I was recommended by a friend to visit omnia with a possibility of botox fillers to try another option as I had already undergone surgery and it was not successful. After having a consultation with the kindest of doctors we arranged a second visit to put this into practice. It's the best thing I've ever done and don't notice any sweating anymore. I couldn't be happier with the results, I'd like to thank all staff at Omnia Dental practice for such a lovely experience and a fast and efficient service to cater for my needs! Would recommend to anybody so thanks again to all. Thank you for your lovely review of Omnia and our team. It's great to hear that you were pleased with results of your under-arm Botulinum Toxin treatment. Enjoy the summer! Great place, friendly staff and a fantastic service! Thank you for your review of the service that you received at Omnia Dental Spa. Your kind words are greatly appreciated by all of the team. See you soon ! Thanks. I have recieved fantastic treatment with Dr Louise Gidda over the last 7 months. I am very happy with my end result and the overall service with Omina Staff was excellent. Everything has met my expectations and I would definitely recommend Omina Dental to all my family and friends. Thank you for taking the time to share your experience of the orthodontic treatment and service that you received at Omnia. It is always great to receive positive feedback from our patients and your comments are warmly appreciated by all of the team at Omnia Dental Spa - Keep Smiling ! Omnia Dental Spa is not my nearest dental practice but it was worth the travel. The practice is modern and inviting and all the staff were friendly and profesional. I am very pleased with the work that has been done on my teeth. Would definitely recommend and visit again. Thank you for your kind words. We are delighted that you are so pleased with the results of your Invisalign orthodontic treatment and we look forward to seeing you (and your lovely new smile) at your review appointments ! Thank you to Dr Gidda for giving me the confidence to smile again following the excellent dental repair treatment to my front teeth. I am truly delighted with the results. Dr Gidda and his team provide a professional and caring environment and I feel fortunate that I have managed to find such an excellent dental service so close to home. Thank you for taking the time to provide your feedback. It was a pleasure to be of service and it is lovely to hear that you are so pleased with your new 'improved' smile ! We look forward to seeing you at your next examination appointment. Dr Gidda and The Team at Omnia Dental Spa provide an outstanding friendly and professional service. My wife and I are patients who travel a 38 mile round trip for our treatment and consider the effort very worthwhile for the high quality standards of dental care we receive. I have recently had a bridge replacement and a veneer added to a tooth. From start to end of the procedure it was handled in a sensitive manner - which is very reassuring! The temporary bridge and veneer looked great (better than the original!!) which made the 10 day wait for the actual replacement a breeze - I am very grateful to Dr Gidda and his colleagues for the fine work. I would recommend Omnia Dental Spa unreservedly. Keep up the exceptional standards. :-). Thank you for your lovely review of the team and the service that you have received at Omnia Dental Spa. It is always great to receive positive feedback from our patients. Thank you for giving us the opportunity to treat you at Omnia. We look forward to seeing you again soon - KEEP SMILING ! Thank you for offering such wonderful, caring and professional service to my 8 year old daughter recently. She was very apprehensive about having the injection for her cavity but from the moment we arrived she was put at ease; first by the professional, friendly manner of the receptionist then Dr Gidda and his dental nurse who were extremely gentle and patient with my daughter; they took their time to reassure and settle her anxiety and completed the dental work she needed to a very high standard. I am so delighted with the service level I received for my Daughter that I am moving my dental requirements to Omina too. I am so grateful to you all, thanks again...... We will take your good advice and stay off the sweeties!!! Thank you for taking the time to provide your wonderful review of the care and service that your daughter received at Omnia. The whole team are delighted to receive your lovely comments and we look forward to seeing you and your family again soon ! I would highly recommend Omina to anyone. I started going about two years ago and in that time I've had a brace and a bridge. My teeth have never looked or felt better. My son is now starting the process of a brace for himself and as a parent I only have the best for my son. Every time I go it's always a happy and friendly environment. I would never go anywhere else. Thank you for your review of Omnia, it's always great to hear that you are pleased with your new 'improved' smile ! Your recommendations are also greatly appreciated by all of the team. Dr Gidda and the team at Omnia Dental Spa have consistently provided an outstanding service during my visits to Omnia Dental Spa. The staff at the practice greet you with a smile and they are always polite and friendly. The practice has a modern and contemporary feel and is maintained to a very high standard. The waiting room is bright and airy and has a vast range of literature for you to view. There is also ample parking at the front of the practice. During my 18 month orthodontic treatment plan I was seen regularly by Dr Gidda and she helped create the perfect smile for me. She is a lovely dentist and has continued to provided great after care since completion of my brace work. Thank you so much for the exceptional service the team at Omnia Dental Spa have provided. I can now smile every day with great confidence! I would definitely recommend this practice to my friends and family:-). I was very pleased with the service I received from Omnia Dental Spa. I had a bad experience at my previous dentist and Omnia Dental Spa was recommended to me. I found everyone to be very professional and helpful and my treatment went well. Previously, I have always been anxious when I have a dental appointment, but now I am so more relaxed. Thank you for taking the time to provide your review of our services. Your comments are greatly appreciated by all of the team at Omnia Dental Spa. I had a tiny chip repaired and filled the work was fabulous. Better than before, I also had a clean and polish at the same time; my teeth feel lovely and have given me a new found confidence. The prices reflect quality work with a dentist you can trust in a very comfortable practice with superb staff. Thank you Omnia. It is great to know that you were pleased with your cosmetic treatment as well as your routine care at Omnia. Thank you for your 'glowing' review of Omnia. All of the team greatly appreciate your kind words - keep smiling ! My daughter had Orthodontic treatment with Louise, who offered a fantastic service. Louise was very informative and reassuring before we made the decision to go ahead with treatment. I would highly recommend Omnia to anyone considering orthodontic treatment. All the staff are very helpful and accommodating. I would not hesitate to recommend Omnia. Thank you for your wonderful review of the service that you have received at Omnia Dental Spa. The whole team have enjoyed being of service and we appreciate your warm recommendation of our Practice. I have visited Omnia a number of times, most recently for facial aesthetics. On each occasion I have been extremely pleased with the overall service. The practice is modern and clean, the staff caring and friendly and the dentist is professional and understanding. Thank you very much for your kind words. Your review is greatly appreciated and the Omnia team looks forward to seeing you again very soon ! I had sustained a fractured tooth which was highly visible and uncomfortable. Dr Gidda and his excellent team reconstructed the tooth with expert ease, to the point where I had to ask which tooth had actually been repaired! As a surgeon myself, I was extremely impressed with the technical skills and service provided by Omnia and would certainly have no hesitation in recommending others to have their treatments performed here. All in all, a fantastic service! Thank you for taking the time to provide a review of your experience at Omnia Dental Spa. Your fabulous feedback and recommendation is greatly appreciated by the Omnia team. Very proffesional service. It is helpful to have the text/phone call reminder service. Very friendly staff, especially the reception ladies. Thank you for taking the time to provide your review of Omnia Dental Spa. Your feedback is greatly appreciated. The team look forward to seeing you again soon ! I would like to say my experience at Omnia Dental Spa was excellent. I recently had my teeth realigned over an 18 month period having made several visits to the practice and I am delighted with the results. I highly recommend Omnia Dental Spa and the Team behind it. Thank you for taking the time to provide your lovely review of Omnia Dental Spa. We are thrilled that you are pleased with your orthodontic treatment. Keep showing off your wonderful new smile ! Every treatment I have had has been done thoroughly and professionally. I find the staff approachable and very reassuring I would and have recommended Omnia without hesitatation. THANK YOU for taking the time to provide your lovely review of Omnia Dental Spa. Your comments are recommendations are greatly appreciated. We look forward to seeing you soon ! After breaking 3 of my front teeth in a fall they had to be removed. From the start of my treatment I have felt reassured and it was always explained very clearly while the work was done. I have now been given my smile back and my teeth look better than ever. I cant emphasize enough how happy I am with the results. Thank you for your review Erica - it was a pleasure to be of service - keep smiling ! Our membership at Omnia Dental Spa is the best investment our family makes. We joined 12 years ago when we moved to Solihull and have been delighted with the service, advice (from gum shields to teeth whitening) and customer care. I was petrified of the dentist having had a bad experience as a child but since using Omnia I can honestly say I now enjoy our check ups - and because they are regular, we very rarely need any further treatment and if we do, every effort is made to ensure our appointments are scheduled to our (sometimes complicated!) diaries. I could not recommend highly enough. Thank you for your review of Omnia Dental Spa, your lovely comments are greatly appreciate by all of the team at Omnia. See you soon ! New to the practice , find the staff very helpful , polite and profesional , the dentist patiently explains exactly what is going on , more than happy. Thank you for your review Ray, your comments are greatly appreciated. Fantastic practice, staff and service!